You just bought a Cricut machine! Congrats! If you have spent any time on my blog you know that I love my Cricut Explore Air 2. But before you can get to creating; you will need to know the basics of how to use this machine. Today I am going to share with you the Best Cricut Tutorials for Beginners to get you started! There is a lot these machines can do, but my goal is just to get you familiar with the Design Space interface. Your creativity can really run wild when you own one of these crafty powerhouses. As you may know, one of my favorite ways to use my Cricut is with all my paper craft and flower template designs. So you will see me use some in examples below. In addition to the beginner’s Cricut tutorials, I will also point you to some other favorite resources of mine that can help you learn your machine inside and out! How do I upload a SVG cut file? How to I use the print and cut method? How do I use the layers panel – move things around, ungroup, attach weld etc? I’m going to cover each one, so let’s get a-going! I’m going to bravely skip to the point and assume you have set up your machine and downloaded Cricut Design Space to your computer or iPad. If you are looking for how to set up your Cricut machine view this help article here. 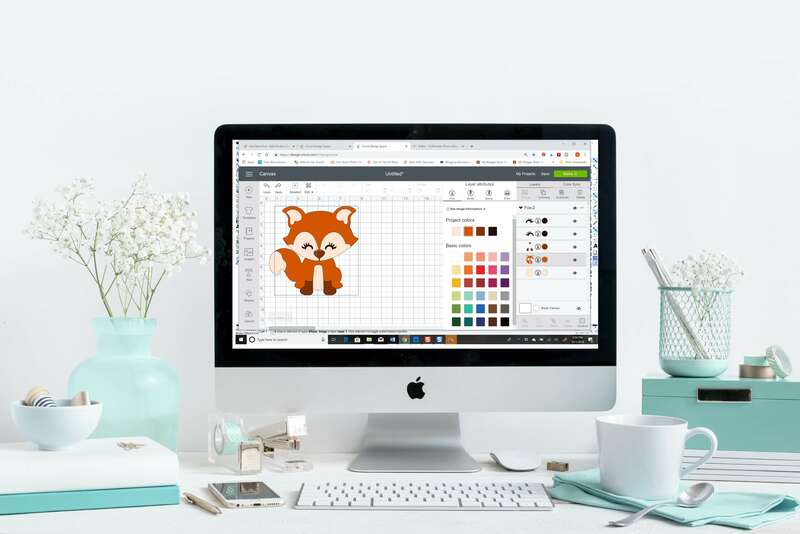 So let’s say you want to explore the world of SVG cut files outside of what Cricut design library offers. There are a TON of files out there on Etsy and for free on blogs. Sometimes people get scared off because they don’t know how to upload an SVG. I’m going to give you a video clip and a couple essential screen shots. A vector image will appear in Design Space! Watch the overview video of uploading an SVG into Design Space. So now you know how easy it is to upload an SVG file! Yay you! In the next section I am going to show you how to play with the files even more. But you might be asking; What if I do not have an SVG cut file? Can I use a PNG or JPEG image and convert it? The answer is YES! Read this short and sweet post on how to accomplish that here! Take a look at this screen shot. I have highlighted those focus areas and will walk you through them in these Cricut Tutorials for Beginners clips! You will need to ungroup an image first if it has multiple layers. Click on the image cut line you wish to hide the you will see that once you close the contour panel that they have disappeared and the image has been simplified. Using the Flatten tool means you will be turning a multi layered vector into a single layer image to print. To flatten any SVG so that it can be printed and cut out like a JPEG or PNG image just select all and click the flatten button at the bottom right hand corner. The attach tool helps you to hold your cuts in the same position relative to one other on the mat, so that when you go to your cut screen they do not shift. See an example of how to use the attach tool on the bottom right of your layer’s panel in my clip below. Click the Attach button at the bottom of the layers panel to your right. The weld tool allows you to join shapes to create a single custom cut image by eliminating cut lines. The weld tool is very useful if you wish to simplify a design or join to existing shapes together, but I think my favorite use for the weld tool is using it with text. When using the Slice tool you will work with 2 layers at a time but make sure they are ungrouped first. Remember, your ungroup tool is at the top of the layers panel. The Slice tool allows you to cut out one shape from another existing shape. Or you can overlap the two shapes to cut a new one out. I also find the Slice tool helpful if you wish to cut text out from a shape. See my screen shot example of the text below. I just placed my text over the seashell base image, selected them both, then pressed my Slice tool. The result was the text cut out from my seashell shape! So cool! Wow! Do you realize you now know how to use everything in the layers panel interface?! Hopefully these very simple Cricut tutorials for beginners help you to feel more confident as you turn on your new machine. My best advice is don’t be afraid to play around! What could happen? You could create something fantastic!